What Are the Real Benefits of an Acupressure Mat? We know you’re busy. So if you can expedite some part of your life, whether that be the dishes, the school drop-off, better sleep or muscle recovery, wouldn’t you be into it? Acupressure mats can do that. That’s why they fit the lifestyle of athletes—everyday, amateur and professional—so well. Acupressure scientific benefits—improved blood and flow, myofascial release—add up fast. But what does that all mean? Acupressure is often called acupuncture without the needles. Acupressure involves stimulating the acupoints in the body with a firm pressure to activate the body’s innate healing ability. In practicing acupressure, Traditional Chinese Medicine (TCM) focuses on the energy flow in the body, while Western medicine has more focus on the relationship between the acupoints, nerve endings that release hormones throughout the body, and trigger points to relieve tension. An acupressure mat—we recommend Acuswedemat’s 14,000 spikes, (how could we not?) targets your body’s areas of tension. And an acupressure mat benefits your life without the hassle of an appointment or co-pay, from the comfort of your living room, driver’s seat or bed. 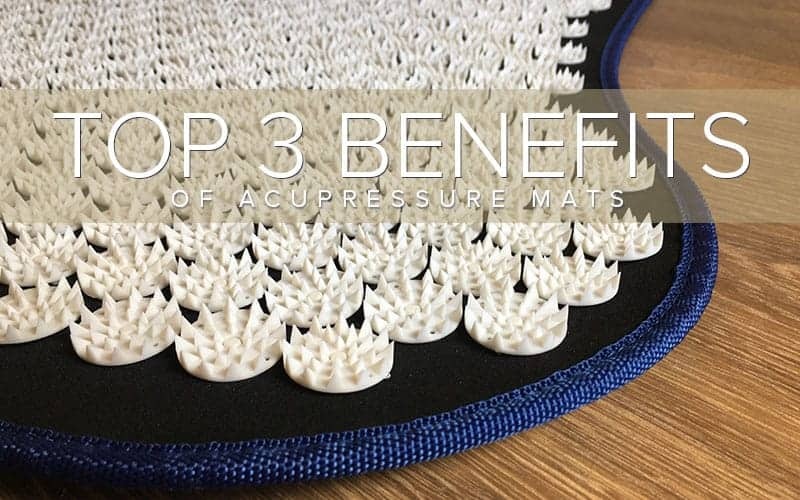 There are a variety of acupressure mat benefits, but we think these are the top three. Scientific Benefit: Acupressure mats improve blood flow. What it Really Means: Increased circulation helps you recover faster and be healthier. Getting more blood supply to your muscles means muscles get more oxygen, nutrients, and fresh fluids so they can heal. It also means moving the toxins and lactic acid out of your system. And the faster you can recover, the faster you can safely move on to your next training or performance. Better blood flow promotes cell growth, and improves the health and vibrancy of your skin, (i.e. reduces wrinkles!) helping you fight off bacteria and infection with ease. Blood flow also ensures your organs are performing at optimal speed—that means your heart. When your heart pumps at full force, your heart rate lowers, heart muscles relax and your blood pressure flows evenly and smoothly. Whew – that’s an amazing list of important functions! Scientific Benefit: Acupressure mats provide myofascial release. What it really means: Loosening your fascia means reducing pain or tension in your shoulders, neck, back and all major muscle groups. Even your feet. Fascia is the biological glue that provides context for the rest of the body. Without it, we’d be a lumpier, flimsier and less contained version of ourselves. When your muscles move, the fascia needs to move freely for optimal performance. If’s it’s restricted, that can mean stress and strain – on your muscles, your joints, your body! Like a sponge, fascia needs to be squeezed and refreshed to clean it out and release the tension. This is why yoga, foam rolling and acupressure mat benefits are so critical. Scientific Benefit: Acupressure mats help your body relax. What it Really Means: You can actually get a better night’s sleep. According to WebMD, another benefit of acupressure mats is in helping people beat insomnia. Research results vary, but laying on the mats are definitely proven to slow the heart rate and encourage relaxation in both your mind and your muscles. And our testimonials prove this. When you compare that to typical nighttime activities like television or Internet surfing, which stimulate both the body and the brain, there’s a big difference.